Sorry about my lame excuse for a post yesterday. You see, all day I was a bit distracted. Because Last night I was attending a cooking class. At the Viking School. With MICHAEL RUHLMAN!!! So anyway, the demo was pretty neat. He's doing these to promote his new book The Elements of Cooking, which is "an opinionated food glossary from a writer and cook who knows better than most what the hell he's talking about. "(from Anthony Bourdain's Introduction in the book. )So the demo consisted of a meal made using some basic yet very refined and important techniques. First he went over how to cure your own bacon, which I am totally doing ASAP. He used the bacon for lardons on a salad, which also included discussions on how to boil an egg properly, shallots, and knife skills. He also went over chicken stock, roux, roasting shallots, sauteeing mushrooms, making fresh pasta, chocolate ganache and choux dough. And you know what? I wanna do it all! And? I'm confident I can, now. Did I mention how handsome Mr. Ruhlman is in person? Anywho, if he's coming to a city near you and you're a fledgling home cook like myself, spring for the class. It's totally cool...informative, informal, intimate and perhaps some other words that begin with "i." 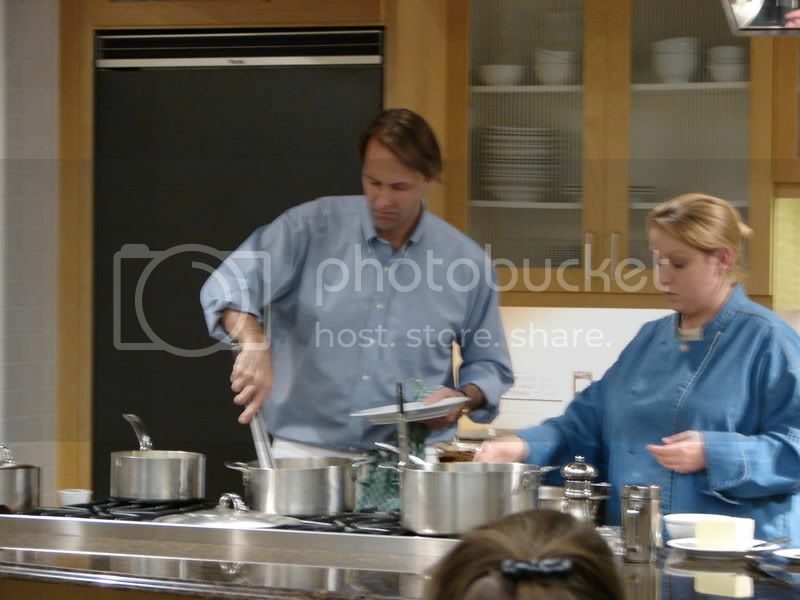 If he's not coming to your locale, at least go get the Elements of Cooking. Everyone's doing it! It's getting (deservedly) positive reviews from all over the place. The best place to read all about the book is on Ruhlman's own blog, where he links to reviews, talks about writing the book and gives his promotional schedule. I've read only the first 12 pages or so. They are packed with info, and I'll probably be rereading parts of this book forever. It's a reference book, but a fun-to-read one. 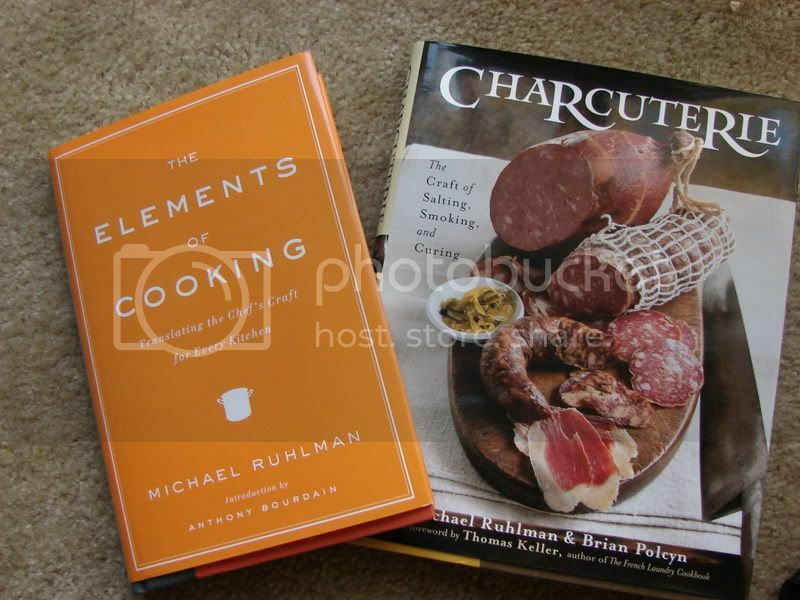 Speaking of awesome Ruhlman reference books, I also purchased a copy of Charcuterie, which Michael co-wrote with a chef he met writing Soul of a chef, Brian Poclyn. A book about curing your own meat and making your own sausage? Who has the time and skill to do that? Actually, reading the book, it's not as intimidating as it seems. Take the bacon. A simple dry cure and a pork belly. Refrigerate, smoke or bake at a low temp...voila. YOU MADE FREAKING BACON! And making pancetta is not many more steps than that. I don't have any sort of meat grinder, but I see that as my next big step in the kitchen...well a kitchen-aid with grinder attachment, at least. 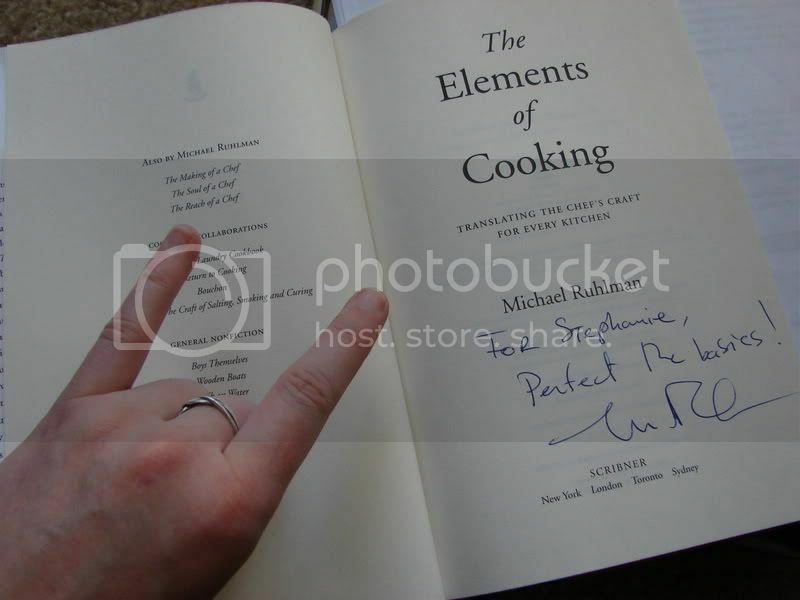 I had him sign Charcuterie for me. I'm so glad he mentioned sausage. Now I have to make some. I feel like it's expected of me. 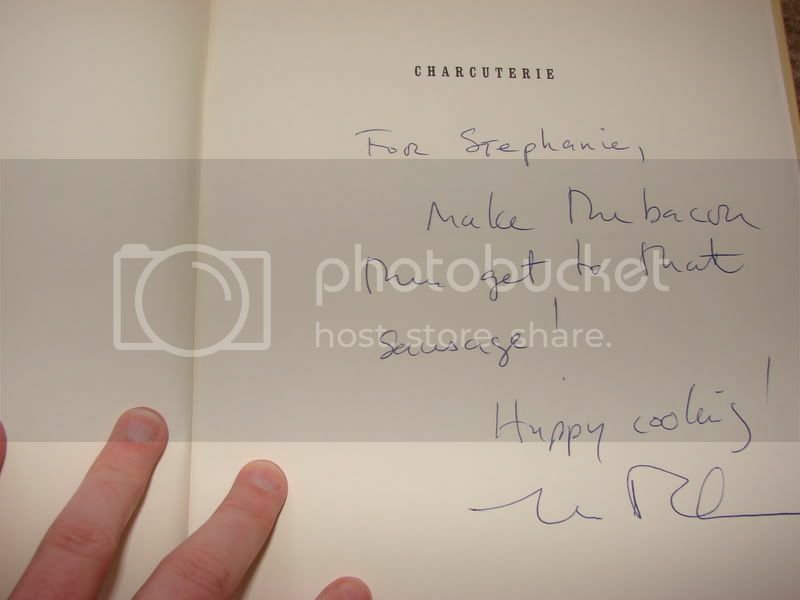 So, yeah, I had two books for Ruhlman to sign, plus one for a friend. And I was probably smiling like a crazy person the whole time I talked to him. He didn't seem to mind, though. SUCH a nice guy. Gracious and friendly and genuine. -After you cure your own bacon (can you tell I'm a bit excited about this? ), you need to cut off the skin. Don't waste it, though! you can add it to stocks!! -When you are making a roux, a good way to tell it's done is that it will smell like a pie crust. -Take out the "germ" of your garlic cloves (the green middle thingy) if you are using a garlic press or if you are mincing garlic for a recipe ahead of time. There is an enzyme in there that will give your garlic a bitter taste. If you are mincing it with a knife or grating it right before cooking it, you don't have to worry about because the heat will negate this effect. -When making stock, it should not boil or even simmer. You can bring it up to heat and put it in a low oven for hours until it's done. Also, add the veggies and aromatics towards the end so they don't get mushy/spongy and make the stock cloudy. 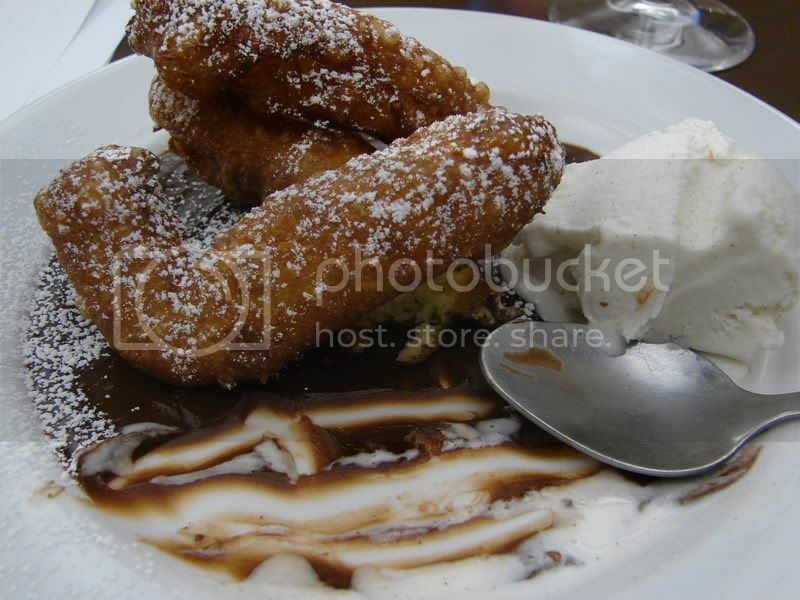 -A "Liaison" is a thickener made from eggs and cream. EDIT: Whoops. I've been in formed that "a liaison has minimal thickening powers, what it gives the sauce is an incomparable texture." I knew I was distracted during that part of the demo. 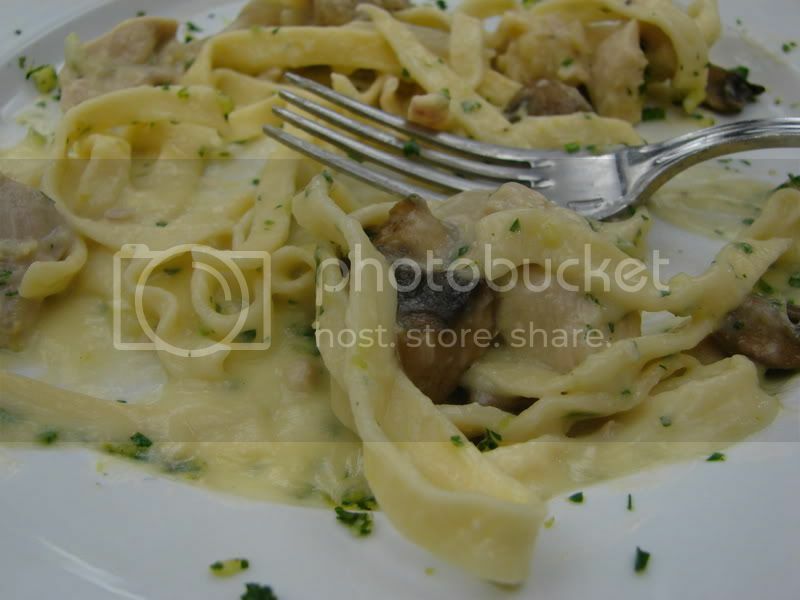 -When rolling pasta, let it rest in between each roll. -"choux" dough can be used for cream puffs (baked), doughnuts (fried) and even boile in water to make Parisian gnocchi. So, there you go. 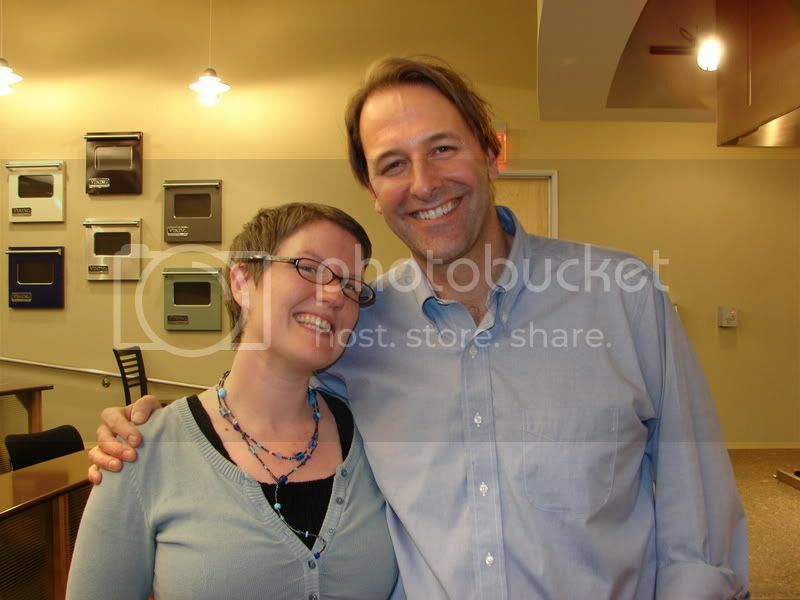 I met Michael Ruhlman, and I'm still glowing like a geeky schoolgirl meeting her favorite backstreet boy. Seriously, though? this is a writer ya'll should read. In fact, I better get off this machine and read some more. ETA: Ian from the RFT's blog gut check has posted about the Ruhlman Viking demo here and here. ETA more: Bill Burge of STL Bites finally got his recap of the Ruhlman Viking show up! I'm glad he said something about the food we were served. I wasn't gonna complain, but I was underwhelmed by the execution (cold pasta, skin on one of my lardons no cinnamon sugar on the choux donuts...). Still a great experience, and I learned alot, and I know when I make these things at home they will be fab. What a great write-up, Stef, I'm so glad you could go to the class so the rest of us could too, if vicariously!